MELISMATIC: IN REVIEW: JoJo Breaks Free, Releases "AGAPE"
IN REVIEW: JoJo Breaks Free, Releases "AGAPE"
Can you believe its been more than two years since JoJo has last "released" fresh material? If her first mixtape, Can't Take That Away From Me, released in the last quarter of 2010, was an introduction to the new grown JoJo, last month's sophomore mixtape Agápē (it's Greek for the word "love," and is also the name of her cute puppy that you see on the cover) is an assertion of strength and identity. Now 22 years young, JoJo has certainly come a long way since the now almost ten years old (!!) "Leave (Get Out)". The epitome of label mishandling, who knows when we will actually hear her proper third record (her sophomore album The High Road was released back in 2006), but with the sprinkling of these bite-sized mixtapes, fans like myself are continually clued in to Ms. Levesque's headspace. While Can't Take That Away From Me read as an almost-album, with several radio ready cuts that simply spoke to an older JoJo fanbase ("Why Haven't You Called" is still my jam), Jo went a different road entirely with Agápē. I'd be hard pressed to call it an album in waiting, as it's quite short (more like a meaty EP, if you will). Despite being 13 tracks in length, almost half are of the interlude variety. Not totally unlike Janet Jackson before her, the interludes help keep things kind of cohesive between full cuts and set the mood. The songwriting is what really shines here and is very reflective of the empty space created in her absence in the major music game, particularly in the R&B-soaked genre. The record opens with "Back2thebeginningagain", a not quite interlude-length/not quite song length intro that sets the stage for many of the recurring themes featured on Agápē, one being obvious discontent at her label ("Two things you gotta do to succeed/One's forget about you/And listen to me" ... "You should make some Katy songs/You should pull your t*tties out/Then I'll put your record out"). "Billions" is a sweeping love song which shows off JoJo's vocal beautiful range and a true control that many of her contemporaries lack. "White Girl In Paris" is complete with some kind of flute/recorder and sung with acoustic guitar accompaniment, lamenting being used and misused in the music industry but being feeling free in Paris, "unfettered and alive". The big single from the project is "Andre", unarguably the most radio-ready of the set and inspired by Andre 3000 of Outkast. It's an homage to the man who isn't afraid to be a little bit eccentric and himself in a world full of people trying to fit in to status quo. As Jo sings, "I'm a sucker for a guy with a Beautiful Mind." It was an early fave simply for its easy singability (that chorus couldn't be hookier simply for that stuttered "Ah-Ah-Ah-An-Andre"). Check her out performing the song acoustically here. However, my absolute favorite of the disc comes at the very end (save the best for last) in storyteller-esque "Can't Handle the Truth". This mid-tempo sparkler really chugs with the focus on her voice and the story she spins (something only recently making a comeback to popular R&B with the rise of Frank Ocean and Miguel), telling a story of a unfaithful chica in the face of a boyfriend who didn't appreciate what he had when he had it. This is the type of modern JoJo I really sincerely hope we get more of in the future. Go do yourself a service and grab the mixtape now. 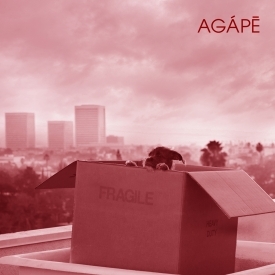 You can download Agápē for free here. I can't seem to make my mind up about what song is my favorite. The whole set just keeps getting better after every listen.